Beautiful valley setting North of Bozeman with amazing views of the Bridger Mountains. Great fishing out the back door on the East Gallatin River. Six bedrooms and six bathrooms. The home has wireless Internet and a hot tub. BRIEF DESCRIPTION: This spacious six bedroom home is located just ten minutes from downtown Bozeman and ten minutes from the airport! The paved driveway is lined with trees creating a beautiful entrance to this special property. The home has a wrap around porch on three sides with gorgeous mountain views, beautiful pastures surrounding the house, and river access at the corner of the property. There is a beautiful lawn, hot tub, gazebo, and fire pit. This is one of the most spectacular outdoor settings you'll find. BEDROOMS AND BATHS: This home has six bedrooms and five full bathrooms. On the main level of the home there is a half bath. All of the sleeping space and five full bathrooms are upstairs. Five of the rooms have windows with spectacular views. The master bedroom has a king size bed and his and her baths. There are two bedrooms with en suite bathrooms and queen size beds. 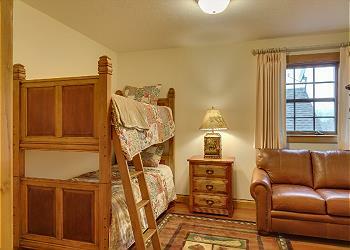 There are two more rooms with queen size beds and one room with a bunk bed. These last three rooms share a full bathroom off the hall. There is also a sofa sleeper in the den on the main level for flexible sleeping space. KITCHEN: This fully equipped and very large kitchen has everything you will need to cook up some great meals for all your guests. In addition to all the cookware and serving ware you will need, there is tons of space to spread out if you are really cooking up a feast. You will also find a good spice cabinet and a gas grill outside for barbecues. DINING AREA: There is a large dining table with seating for ten guests. LIVING ROOM: The home has tons of living space and seating areas. There is a small living area adjacent to the dining and kitchen area. There are a couple of comfortable sofas and chairs with a TV. There is also a large seating area in the middle of the house with big windows looking across the East Gallatin River to the Bridger Mountains. The second TV area is at the back of the house and has a comfortable leather sofa and two leather chairs situated around a wood burning fireplace. There are two doors leading from this room to the back deck. There is also a den on the main level with a sofa sleeper and another TV. SETTING, ACREAGE, VIEWS: Nelson Farmhouse is located on an amazing twenty acre property just ten minutes North of Bozeman. With the river a short walk from the house you'll have great fishing access. Unobstructed views of the Bridger Mountains from the back deck is nearly all you see. OUTDOOR AMENITIES: The deck! This home has seamless indoor / outdoor living. The deck wraps around three sides of the house with lots of outdoor seating, and lounge chairs to soak up the sun. There is a fire pit surrounded by Adirondack chairs and a charming gazebo with festive lighting. You'll find plenty of room for outdoor entertaining. CLOSEST TOWN AND AIRPORT: It's about a ten minute drive to the Gallatin Field airport or to downtown Bozeman. Belgrade, which has quite a few restaurants and a couple good grocery stores, is also ten minutes from the home. Livingston is 30 minutes away and Big Sky is one hour from the home. ACTIVITIES NEARBY: Besides fishing before breakfast, there is horseback riding, rafting, golf, tours of Yellowstone National Park and everything that the towns of Bozeman, Belgrade, Big Sky and Livingston have to offer. Yellowstone is about an hour and a half away. Perfect for extended family. Plenty of space for togetherness or please leave us alone for now. Kitchen was super for family cooking and dining. I would rent again in a minute. Wonderful! The location and ability to accommodate our big group were just great. The house is so beautiful and it was the perfect way to experience Bozeman! Staff and ease of checkin were amazing. Thank you for being so wonderful! Our family of 10 (all adults) had an absolutely wonderful trip and a big part of it was staying in this absolutely beautiful house! Perfect location and the most wonderful beautiful mountain scenes all around. Woke up to deer and went to sleep with deer feeding all around. Also, we had 3 fly fisherman that loved being able to just walk down to the creek and fish (we even had trout dinner one night). It's a gorgeous place and we hope to stay there again real soon. Our family had a fabulous time - the house is setup great for a larger group. Great location, house is great! The number of bedrooms and family rooms were great for our larger group. We would definitely stay again. A good time for all ages in the heart of Montana. Very well kept and spacious house with great views and fishing access. Accommodated our three generational family gathering nicely, and allowed provided amenities to entertain local family and friends as well.